Lorentz Take: Mike Lorentz recently enjoyed a visit with the folks from Fleisher’s Grass-Fed & Organic Meats, both on their home ground and at the Lorentz facility. Even when New Yorkers jump on health kicks like morning raves and veg-forward fads (see Narcissa‘s carrot Wellington, Semilla‘s root-to-table tasting menu), we always return to artery-clogging, hangover-curing meat. 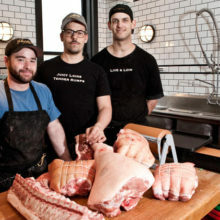 From burgers and steaks to poultry and swine, find the perfect butcher shop for grade-A meat cuts in New York.